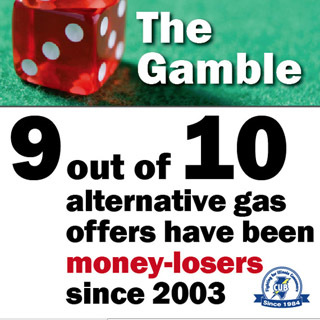 CUB’s free online tool, the Gas Market Monitor, has some startling findings about Northern Illinois’ natural gas market: 9 of 10 plans offered by unregulated suppliers have been money-losers since 2003. CUB announced the numbers in a news conference today to give Northern Illinois households a warning as they prepare for another long winter. “Choosing an alternative gas supplier is exactly that: A choice,” CUB Communications Director Jim Chilsen said. For more than a decade, Northern Illinois consumers have been able to choose a company other than the regulated utilities to supply their heating gas. CUB has been gathering supply prices offered by these alternative companies and feeding them into the Gas Market Monitor, which makes an apples-to-apples comparison between the plans and utility prices. Through October, the Gas Market Monitor shows that of 9,046 plans analyzed since 2003, 94 percent have lost money compared with the prices offered by regulated utilities. While alternative suppliers don’t share how many customers are on their plans, CUB estimated what the outcome would be for each plan if a customer stayed with it through the end of the contract term, based on typical usage of 1,325 therms a year. The losses ranged from pennies to hundreds, even thousands of dollars over the lifetime of a plan. The Gas Market Monitor, which also can be found at www.CUBGMM.com, shows you the track record of the gas market to date, and it has tips on avoiding bad deals for current shoppers. Maria Leonardi spoke about her poor experiences with alternative energy suppliers, who came to her door and pressured her into signing up for a deal. While 350,000 consumers were on unregulated suppliers as of December 2014, this might not be the best time to go with another company. Regulated utility prices are at their lowest point in nearly 15 years. And the utilities don’t expect average prices to go above 40 cents/therm this winter. Remember, you’re not required to switch to an unregulated gas supplier. Unless you’re sure you do want to switch, don’t give out your account number or gas bill. A shady marketer could use that information to illegally switch you.